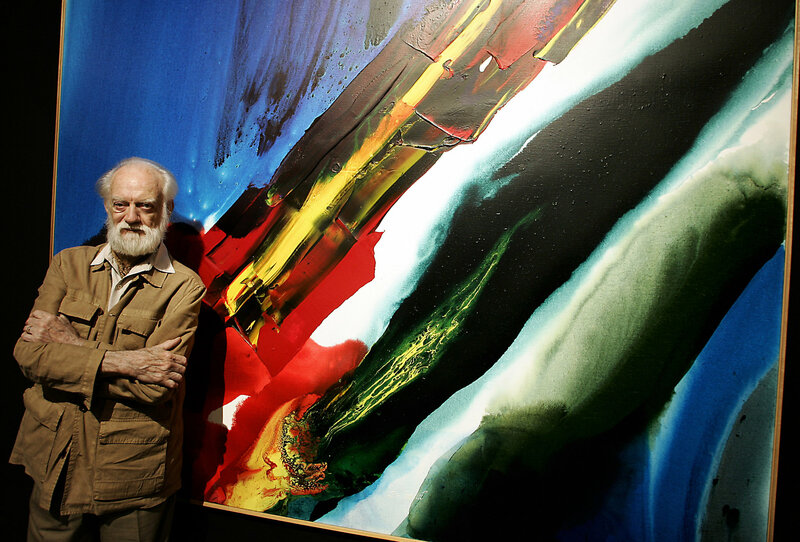 Paul Jenkins, an artist originally associated with abstract expressionism, exhibits in his mature works a redefining of color, light and space on the canvas surface. Born in Kansas City, Missouri in 1923, Jenkins worked as a teenager in a ceramics factory, where he was first exposed to color intensity and the creation of form. From age 14 to 18, he studied drawing and painting at the city’s Art Institute. Initially interested in drama, Jenkins received a fellowship to the Cleveland Playhouse, then continued his dramatic studies in Pittsburgh at the Drama School of the Carnegie Institute of Technology. Deciding to become an artist, Jenkins moved to New York City in 1948 and studied at the Art Students League. During Jenkins’s three years at the League, Yasuo Kuniyoshi and Morris Kantor were his influential instructors. While Jenkins continued to live and paint in New York City, his personal explorations took a metaphysical turn, which would ultimately become dominant in his work. In 1953, Jenkins traveled to Paris, where, a year later, he had his first one-man show. While working at the American Artists Center, he continued to experiment with flowing paints, pouring pigment in streams of various thicknesses, with white thin spills as linear overlays. Jenkins’s intent was to deny stasis and create a literal and metaphysical sense of dynamism, while maintaining a sense of unity. Beginning in 1958, Jenkins titled each canvas Phenomena, with additional identifying words. He believed the work to be descriptive of the discovery process inherent in each painting. Paralleling his beliefs, the artist’s paintings have undergone subtle but definite changes. Beginning in the early 1 960s, a shift of color saturation and exposure of the white areas gave Jenkins’s canvases an enhanced feeling of illumination. If Jenkins’s technique is unorthodox, he is in many other ways a traditional artist. He works in an acrylic medium on traditional linen canvas or fine rag paper. Often he uses an ivory knife or a brush for finishing, but never allows a stroke to show.